This converted church now houses a tavern, but has played host to a variety of restaurants since the 1970’s. 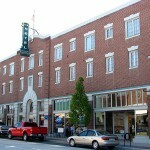 The building is supposedly haunted, with staff and diners alike reporting a shadowy apparition and an unseen presence. every time I go to use the downstairs bathroom. I get a real eery feeling walking towards it and when inside, I feel a strong presence near me. It is always there.